It’s tradition in America at the start of a New Year to make resolutions that will somehow better our lives or the lives of others in general. And why not? We all want to improve, we all need to improve. As the old cliché goes, “The journey of a thousand miles begins with one step.” Heck even the great sage Taylor Swift said, “This is a new year. A new beginning. And things will change.” Wow! Profound! 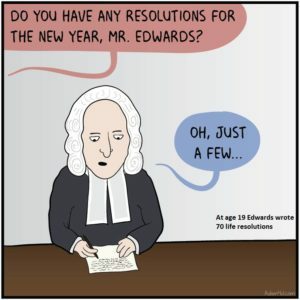 An online polling firm found that only 32% of people did not plan on making New Year’s resolutions. Of those who will, here are the top five: Eat better. Exercise more. Spend less money. Get more sleep. Read more books. Sadly, February 4 is the day most fall off the wagon. Data from one online retailer reported that customers’ alcohol consumption picked up by about 40% in the first two weeks of February—while juice-cleanse sales dropped by 25%. Also, more ice cream and pizza are eaten in early February than during the first two weeks of January. #37: Resolved: To inquire every night, as I am going to bed, where I may have been negligent, what sin I have committed, and how I have denied myself. I will also do this at the end of every week, month, and year. #38: Resolved: Never to speak anything that is ridiculous, trivial, or otherwise inappropriate on the Lord’s Day or Sabbath evening. #45: Resolved: Never to allow any pleasure or grief, joy or sorrow, nor any affection at all, nor any degree of affection, nor any circumstance, but what advances the gospel. I don’t think you’d invite ole Jonathan out for a beer after seeing “Return of the Jedi.” After church. Simple, huh? I’ll check back with you in 2019 to see how well you did.